Papergraphics lead the market through understanding and delivering cutting-edge, hand-picked new technology and products for industries that CREATE, and the Tractus 3D High-Temperature printer is a prime example of remarkable technology that will be instrumental in the driving the future of specialist 3D printing. The Tractus high-temperature printer is an outstanding inclusion in the Papergraphics 3D print-technology range. It is a specialist printer for low-volume production of prototypes, intricate end-use designs and articulations for animatronics across technical modelling, medical, aerospace, oil, gas and automotive industries where the traditional techniques of using metal are too complicated or costly. The Tractus 3D high-temperature printer utilises two particular specialist materials in producing 3D renditions. The first is known as PEEK (Polyether Ether Ketone) and the second is PEI/ULTEM™ thermoplastics, both are recognised as groundbreaking materials within the 3D industry. PEEK is a colourless, organic thermoplastic polymer that performs better than almost any other thermoplastic in the market. It is a high-temperature material that has exceptional properties such as chemical resistance, a low moisture absorption and outstanding durability and strength. Whilst lightweight, PEEK is so strong that it can even be used as a substitute for certain metals. PEI/ULTEM™ is a variant of the PEEK material and is a thermoplastic that has extreme high-temperature resistance, great dielectric strength and an excellent strength-to-weight ratio. PEI/ULTEM™ is the material of choice for medical prototypes due to its low moisture absorption. Its strength to weight ratio makes this the ideal material for aerospace designs. In addition, PEI/ULTEM™ has a lower price point compared to PEEK and therefore is the material of choice for 3D prototyping projects. 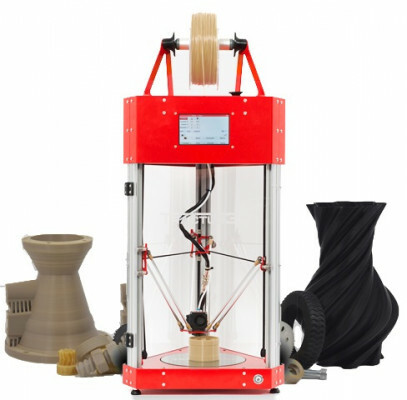 If you are in the business of 3D product development, animatronics or specialist 3D prototyping and your designs require that extra bit of detail and durability, then the Tractus 3D high-temperature printer should be viewed with interest as a groundbreaking piece of equipment and a solid investment. Give us a call for further information or to set up a meeting and demonstration. The estimated time remaining shown on the printer console has to be taken with a pinch of salt ... it's a bit like Microsoft when your installing updates !!! Our PEEK 3D printer can print a wide variety of materials. It can print anything from the more standard materials such as PLA, ABS and PETG to high temperature materials such as PEEK and PEI/ULTEM™ and everything between, such as POM, PRO1, Nylon, NinjaFlex, etc. Tractus3D embraces innovation in any way possible. We do not like good, we want great or perfect. While the latter is difficult to achieve with our mindset to always keep improving, we feel like we are doing a pretty good job. We get to use our passion to create a state-of-the-art product range. We incorporate all of the latest technology in our 3D printers. That is how we make sure that we stay ahead of the competition. The T650P PEEK 3D printer has a nozzle that can reach a temperature of 475 degrees Celsius and its build plate goes up to 175 degrees Celsius. This, alongside its closed chamber to ensure better temperature stability, allows you to print with high temperature materials such as PEEK and PEI/ULTEM™. We never compromise on quality, which is why all production is kept in-house to ensure our Dutch craftsmanship is used to make every printer we build the best it can be.